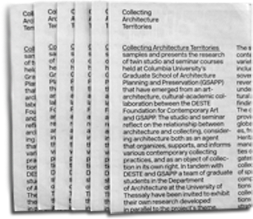 A new art-architecture, cultural-academic collaboration between DESTE Foundation for Contemporary Art and Columbia University’s Graduate School of Architecture, Planning & Preservation (GSAPP) on the topic of Collecting Architecture — Territories. Inspired by an ongoing dialogue between Deste and Columbia University GSAPP, this collaboration is rooted in both partners’ wish to further explore the character and dynamics of the intersection where art, architecture, collecting practices, curating, design and urban communication meet. Perceived as a mutual provocation between a foundation and academic institution, between artists and architects, and between minor and major urban realities, the experiment is organized like a laboratory of ideas. The collaboration aims to generate new areas of knowledge, to develop an international network of researchers, as well as to tap new sources of creativity, forms of expertise and interaction, relying on both GSAPP's pedagogy and Deste's unconventional cultural character and multilayered program of activities. 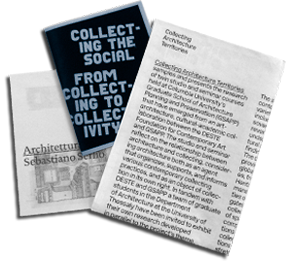 A graduate studio and a seminar probing the dual senses implied by the term Collecting Architecture: considering architecture both as an object of contemporary collecting practices, as well as an agent that organizes and supports, but also challenges and reflects on contemporary collections. The studio analyzes the spatial, organizational, and social parameters of collecting architectures in the context of contemporary Greece. Speculating upon these findings through research and design the studio explores architecture and Athens through a variety of collection circumstances, including the EU and sovereign association, state debt and revenue collection, ans the city understood as an assemblage of cultural assets. The seminar, organized as an editorial office, examines how the architecture of private collections has evolved in recent decades, identifying the emergence of new typologies of “collecting architecture.” Teams of students are compiling information on over 70 different institutions, a global territory that stretches from Hobart to Oslo, ranges from metropolitan cores to rural villages, and spans a spectrum from the largest private collections to the smallest, agenda-driven foundations. The emphasis upon territories highlights the spatial proliferation of various collecting activities, which have shifted from the traditional centers of art-world power, to operate across a new constellation of global cities, and increasingly, a range of "non-sites." Both the seminar and studio focus on the infrastructures of movement, the networks of circulation and financial investment, the technologies of protection, as well as the strategies of viewership and exposure implicated in the territories of collection, examining Deste as one typology within this expanded cultural territory, viewed within the global context of the Foundation's activities and the particular significance of its Greek base. Several features of the project foster exchange between the studio and seminar, ensuring a strong link between the two courses as well as advancing research and editorial production. The research will be synthesized in a publication, introducing a thematic series to be published on an irregular basis. A continuous public editorial office will extend the laboratory into Deste’s premises in June, culminating with the presentation and review of the material produced since the beginning of the project last January. As part of the expanded dialogue between Deste and Columbia University GSAPP, a team of graduate students in the Department of Architecture, University of Thessaly, have been invited to engage the project's theme and to participate in all related events. With the participation of artists, architects, academics, curators, writers, and graduate students, a micro-seminar this June at Deste Foundation in Athens will discuss the developing research and develop the outline of a special publication designed to elaborate the research project and due to be released in the beginning of 2013. By incubating radical ideas that test the limits of artistic and architectural practice, Collecting Architecture - Territories is a collaboration between Deste and GSAPP designed to create new visions for how art and architecture will inform the future of our global world and contribute to the evolution of related fields.